St Alban`s Anglican Church was dedicated as a war memorial to those who died in service or were killed in action in World War One. 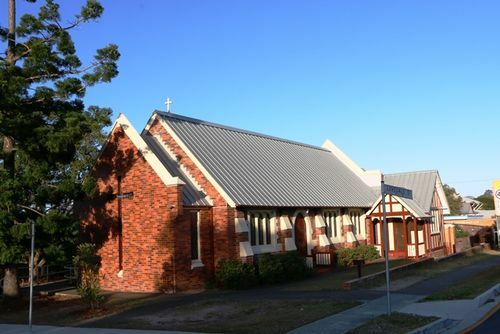 The first church of St Alban’s was a simple wooden structure, built in 1914, which served as a local school during the week and an Anglican church on weekends. In 1929 the present brick church was completed, partly as a memorial to the large number of local men who went off to war and were killed or wounded. The church was dedicated on ANZAC Day 1929 by Dr Sharp, Archbishop of Brisbane. 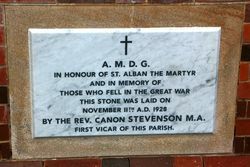 The foundation stone of the new War Memorial Church of St. Alban at Wilston, was laid yesterday afternoon by Canon W. H. W. Stevenson, in the presence of a large congregation. Other clergy present were Revs. A. D. Baker, J. Wilkins, and F. Bates, in addition to the vicar (Rev. B. F. Brazier). The new church will be of brick, and the first section, consisting of the sanctuary, chancel, and part only of the nave, will cost £2540, and is situated at the corner of Inglis and Loveday streets, Wilston. In his address Canon Stevenson, who was the first Incumbent of the Wilston Parish, traced the history of church work there since the establishment of the parish in 1914. After the laying of the foundation stone addresses were delivered by Mr. J. S. Kerr, M.L.A., and Alderman Lanham. The music for the service was provided by St. Alban's choir, under Mr. A. W. Hulbert. The afternoon collections totalled £84. The Brisbane Courier (Qld), 12 November 1928. This stone was laid on November 11th A. D. 1928 by the Rev. Canon Stevenson M.A. First vicar of this parish.